A big part of keeping your dog happy and healthy is making sure that he gets enough exercise. Just as for humans, physical exercise is necessary to keep a dog’s stomach, bones and joints, and brain functioning smoothly. Sporting group: The setters, retrievers, spaniels, and pointers of the sporting group were developed to do a long day’s work in rough conditions. You simply cannot give these dogs enough exercise. Thirty to sixty minutes every day is ideal; three thirty-minute aerobic sessions a week is the bare minimum. Herding group: Like the sporting dogs, herding dogs have very high exercise needs — 30 minutes to an hour daily would be ideal, twice that for the super-athlete known as the Border Collie. Neglect the bodies and minds of these dogs at your own risk. Hound group: Two kinds of hounds, with two different kinds of exercise needs. The hounds developed to follow animals with their noses — Beagles, Foxhounds, Coonhounds — have exercise requirements similar to the sporting breeds. The dogs known as sighthounds, such as Greyhounds, Afghan Hounds, and the deerhounds, aren’t quite as demanding. Bred to expend their energy in short, intense bursts, sighthounds would rather sleep than run. An easy daily walk and a twice-weekly hard workout suits them fine. Working group: A mixed bag here. The breeds developed to guard, such as Rottweilers, Mastiffs, and Great Danes, don’t need as much exercise as a breed like the Portuguese Water Dog, which was developed to work retrieving fishing nets in cold water. *Terrier group: The dogs most people identify as terriers — small, wire-coated dogs such as Scotties — are such incurable in-your-face busy-bodies that they get a lot of exercise on their own. And their small stature and short legs makes a brisk walk an aerobic workout for them. As such, a good walk three times or more a week suits them fine. Toy group: Like the terriers, toy dogs don’t need a lot of help from you to get their exercise — they’re always moving, and their short legs make your brisk walk a good workout. Teach these bright little guys to fetch, and you can have serious aerobic time in your home’s hallway. Like all dogs, toys need exercise, but they don’t need all that much room to roam. *Non-sporting group: Alas, it’s impossible to generalize about this bunch, which is the AKC’s version of a grab-bag — any breed that didn’t fit elsewhere ends up here. So you have to look at the background of the breed and go from there. Fetch is a fantastic way to give your dog aerobic exercise. Get an old tennis racket to get some real distance on those tennis balls. Jogging is another great exercise. If you don’t jog but your dog is well-behaved on-leash, you may have a friend or neighbor who’d welcome the company and the added security. Swimming is a natural for retriever types. Playing with other dogs is a first-rate way for your dog to exercise if you’re lucky enough to be near an off-leash dog park. 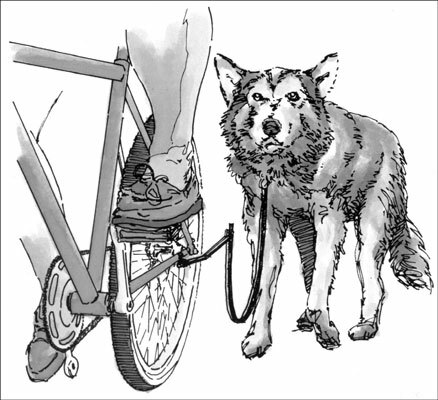 Bicycling is another great exercise, and products are on the market are designed to help you bicycle safely while with a dog. They attach to the bicycle and allow you to keep both of your hands on the handlebars — a much safer plan than holding onto a leash with one hand and the bike with the other.